HUL’s annual report gives a glimpse into what happened. In FY09, its reporting year changed from December to March. Since it was a 15-month period, we have annualized figures for comparison. HUL’s detergent sales grew by just 2% during FY09 but per unit realizations jumped by nearly 30%. If consumers wanted cheaper options, one would have expected Nirma, which has a sizeable presence at the mass end, to gain. But surprisingly, Nirma’s pricing strategy in FY09 was identical; per unit realizations jumped by 34%, even higher than those of HUL. That seemed to have put off consumers, as volumes dipped by 9% though its revenues grew by 22%. Godrej Consumer Products Ltd (GCPL) is among the large companies that did not try to exploit pricing power. In FY09, HUL’s soap realizations jumped by 18%, a year in which GCPL’s realizations increased by only 8.3%. While HUL’s soap volumes fell by 4% during the year, GCPL’s increased by 16%. Strangely, Nirma did not hike prices but its volumes did not grow much either. 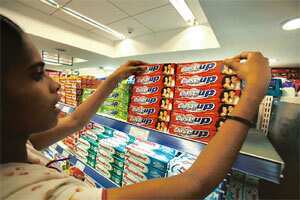 Recent news reports have talked about HUL being under pressure to regain market share in its key categories. It could perhaps take a leaf out of the strategy book of toothpaste maker ColgatePalmolive (India) Ltd. The company does not give toothpaste numbers separately but clubs it under soaps, cosmetics and toilet preparations. Since toothpastes contribute to 96% of total sales, this segment can be used as a good proxy. Realizations during FY09 were up by just 1% but volumes grew by a healthy 13%. Despite being the market leader, Colgate has chosen to increase prices carefully, not allowing competition to gain share when the tide turns. It has not forgotten how low-priced products such as Anchor toothpaste became serious competitors years ago by playing the price game. It fought back hard to gain share, launching products at several price points and investing heavily in advertising and promotions. It has no intention of repeating that exercise. In FY09, its growth may appear more sedate but is more sustainable and should serve as an example to other marketers.